Q. 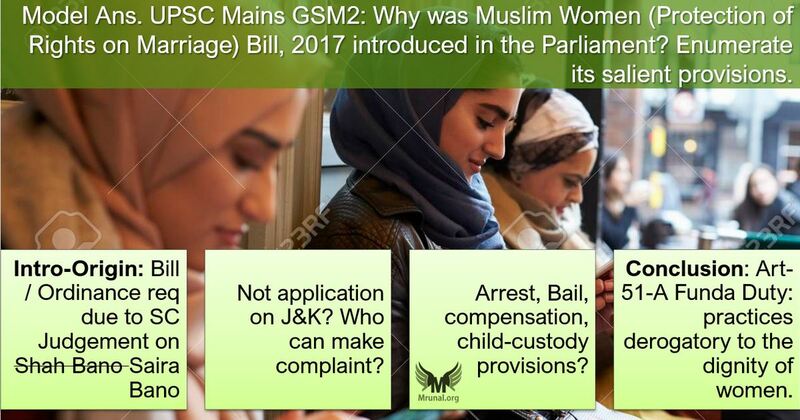 Why was Muslim Women (Protection of Rights on Marriage) Bill, 2017 introduced in the Parliament OR Why is Triple Talaq Ordinance is announced by the Union Government? Enumerate its salient provisions. 150 words, 10 marks. मुस्लिम महिला विवाह अधिकार संरक्षण बिल / अध्यादेश प्रस्तुत करने की आवश्यकता क्यों खड़ी हुई? इसके मुख्य प्रावधानों की सूचि दीजिए. Relevance to Syllabus of GSM2? mechanisms, laws, institutions and Bodies constituted for the protection and betterment of these vulnerable sections. (Definition) ‘Talaq’ means divorce by the husband. Islamic laws provide for three kinds – ‘talaq-e-ahsan’, ‘talaq-e-hasan’ and ‘talaq-e-biddat’ (also known as Triple Talaq). Talaq-e-biddat refers to the practice under Muslim personal laws where pronouncement of the word ‘talaq’ thrice in one sitting by a Muslim man to his wife results in an instant and irrevocable divorce. (Origin) In the Saira Bano case (2017), the Supreme Court ordered that 1) Triple Talaq violates Article 14 (Equality), and Triple Talaq is not an essential religious practice of Islam, therefore enjoys no protection of Article 25 (Religious freedom). SC also directed the parliament to legislate on this matter within 6 months. [If ordinance asked then continue further] But, the bill couldnot be passed in the parliament due to lack of majority of the ruling party in the upper house, ultimately the Government of India decided to bring in ordinance on the matter under Article 123. Since question says “WHY bill / ordinance proposed”? therefore ideally you should give both definition and origin of the matter. The “internal difference between the bill’s features vs ordinance’s feature” is an irrelevant topic / question for prelims / mains. Just memorize the major features and write any one column depending on whether the question is for bill or the ordinance. Applicable on entire India, except the J&K Same. Non-bailable Magistrate may grant a bail to husband after hearing the wife. No explicit mention of compounding. Compoundable (i.e. settlement possible between the victim and husband) with the permission of the Magistrate. Concerns that how can husband pay maintenance if he’s in jail, and given the cognizable & non-bailable nature of offense, it could be misused by wives similar to the misuse of IPC Section 498-A (Dowry & Cruelty to wife) by arrogant wives to ‘teach lesson’ to her husband and in-laws. Thus, government has come up with a strong bill / ordinance to eradicate the practice it will go a long way in ensuring the justice to the Muslim women. This will be a stepping stone for next set of reforms such as outlawing nikah halala and polygamy. WRONG Conclusion: Instead of enacting a bill /ordinance need of the hour is to do _ _ _ _ something else entirely. Missing the main point that Supreme Court judgement required parliament to enact the law. Using the term Shah Bano instead of Saira Bano. ‘Nikah Halala’ not outlawed yet, yet some candidates write that both Triple-Talaq and Nikah-Halala are outlawed. Directly mentioning the provisions of the bill and then later on mentioning why this bill was required. Too much concern / criticism about the bill, when the question is simply asking you to list the provisions.